I didn’t know it at the time but in November 2004 I left Glasgow to live in Edinburgh. This came about after a trio of deaths in the family. That, and a creeping disaffection with my home city. Glasgow looked like it was sleeping rough, with Sauchiehall Street standing in for Pottersville, George Bailey’s hallucinatory hellhole in Frank Capra’s It’s a Wonderful Life. Thanks to the city’s planning and licensing laws, the strip between Charing Cross and Rose Street promoted two competing rows of incontinent bars, gambling venues, fast food joints and charity shops, their signboards changing every few months. Back then I had a passion project in mind – to make a record of what I was leaving behind, since unlike Edinburgh, Glasgow is a city in a state of perpetual reinvention; a constant shedding of skin. Blink and you’ll miss it. My idea seemed to segue with Harry Bell’s theory of a network of sites being built on and rebuilt on over centuries, if not millennia. My aim was to record a tiny piece of the timeline, those places overlooked by the camera, an aim anchored by Harry Bell’s ideas of invisible tracks crossing the city, connecting otherwise disconnected places. One of my inspirations is Frank Wordsall’s The City That Disappeared, published in 1981 by The Molendinar Press. This fine book laments not only the loss of the city’s great landmarks but ordinary dwellings, for what is a city if it can’t house its people? But while many were glad to be rid of slums, by the time Wordsall’s book appeared, the majority of Glaswegians were living in new slums, many designed by renowned architects and many of which have since been razed to the ground. Today I’m going where my instinct takes me, so I return to an area in acute identity crisis – Govan and Plantation. For centuries, there existed a tension between Glasgow and Govan, a burgh so influential that at one time it threatened Glasgow’s borders and fiscal interests. Even today there is evidence of this, with schools in outlying districts bearing the legend ‘Govan School Board‘. By the early twentieth century, Govan’s primacy had waned and the burgh was soon subsumed by its bigger, burgeoning neighbour. My first stop is 87 Brighton Street, where my paternal grandmother lived after being rehoused in the late 1960s from her two-apartment tenement in Houston Street, Tradeston, to make way for the construction of the Kingston Bridge. The bridge, opened in 1970, was built to handle 20,000 vehicles a day. Today it carries 150,000 vehicles daily and along with the M8 motorway is considered to be one of the most badly designed routes in Europe. Before she died in 2003, one of my mother’s pet predictions was that the car would eventually kill the city. She may yet be proved right. Today Brighton Street – along with much of the surrounding area – is earmarked for demolition. Most of its three-storey, grey flats have sheet-metal hoarding fixed to windows and close entrances. Setting up my camera, I’m struck by the number of taxis, both black cab and private, dropping off passengers outside the high-rise flats at Iona Court, sandwiched between Kintra Street and Broomloan Road, aka Wine Alley. Several years ago Wine Alley was demolished but not soon enough, according to my uncle, one of the Alley’s last surviving tenants before he was rehoused in McLean Square. The cumulative effects of poor maintenance by the city’s housing department and a growing anti-social minority turned adequate housing to absolute squalor. The final straw for my uncle came when he unblocked a lavatory and retrieved a dead dog. Iona Court will vanish too one day, no doubt replaced with lower-level dwellings, a type currently under construction in nearby Summertown Road. A sleek black Nissan 4-wheel drive parks up close to 87. A short, white-haired man gets out, carrying a sheet of glass. Seeing my camera he pauses to inquire if I’m anything to do with Taggart, the long-running TV cop series that for over 25 years has co-opted virtually every part of the city as its backdrop. It’s the standard question asked of anyone seen with a video camera, especially in the less salubrious districts. I explain to the man that my grandmother lived in the area and in turn, ask him about the changes taking place here. The man has difficulty breathing, each phrase interrupted by a disquieting gasp for air. He tells me, without qualification, that the new houses being built are being allocated to ‘asylum seekers and junkies’. I try to elicit a response about the use of public funds for Pacific Quay, but the man’s unconcerned. Changing the subject, I nod at the sheet of glass and ask if he’s replacing a window. No, it’s for a memorial for my wife. He explains that his wife passed away and the glass will be used to protect the floral tributes at her gravestone from the elements. As a parting shot I ask if how he finds living here. I don’t, he says, I’ve got another house elsewhere, but doesn’t offer any clue to its whereabouts. I don’t bother to ask what he’s doing with two houses. Back to minding my own business, I note a curious cast-iron cylinder marked Glasgow Corporation Electricity Department, presumably for street and stair lighting. Momentarily I muse on how the City of Glasgow until relatively recently owned and managed a vast infrastructure – housing, transport, education, health, policing, parks, libraries, electricity. How much longer, I wonder, before today’s city council legislates and outsources its way out of its remaining civic duties? 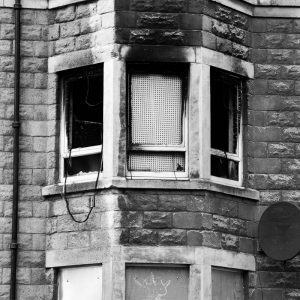 I walk among row upon row of blanked-out windows and closes, punctuated with patches of scrubby spare ground, gap sites ripe for redevelopment. Where, I wonder, did the people go? It’s hard to believe that I’m standing on a prime site, given its proximity to the river and the city centre. I note how few people pass by. Those that do are hunched over mobile phones. Moving on, I pause at a side street next to the Govan Town Hall, an imposing red sandstone Beaux-Arts building, designed in 1887 by architects Thomson and Sandilands and completed in 1899 at a cost of £60,000. The building is currently in a schizophrenic phase, home to two very different entities: the city Social Work department and Film City Glasgow. Here the split personality of Glasgow is epitomised, with the social work department fulfilling a vital role in the daily lives of Govanites, a role I’m certain the city would prefer to diminish since it so blatantly contradicts the marketeer’s slogan – Glasgow: Scotland with Style. Equally heavy on subsidy is the flipside of Govan’s new giro economy, an enterprise based on a Danish business model, Filmbyen, home to production company Zentropa, which is housed in a collection of ex-army buildings in Copenhagen. At a cost of £3.5 million, Film City Glasgow is funded mainly through public sources, including the European Regional Development Fund, set up for areas that, as their website states – “compare unfavourably with the Union’s average levels of prosperity“. Walking around, it’s plain that Govan qualifies, although it’s questionable whether a facility for film production can fulfil the EU remit of creating local employment or promoting social justice in the community. Few would guess from FCG’s appearance that it contains the infrastructure of a dynamic creative industry. There’s no obvious signage, apart from the coat of arms above the main entrance, bearing the legend, ‘nihil sine labore’ – nothing without work. Leaving Govan, I head east along Govan Road towards Pacific Quay, the old Plantation area. On my last trip here I had only skimmed the surface of this shiny new development, part of Clyde Waterfront, a reported £1.2 billion strategic partnership between the Scottish Government, Scottish Enterprise, Glasgow City Council, Renfrewshire Council, West Dunbartonshire Council and Communities Scotland. This mix of public and private development includes the headquarters of BBC Scotland and SMG, the Glasgow Science Centre, an Imax cinema, the Millenium Tower, Medius, a digital media quarter, another digital media centre in Brand Street, the City Dock on the site of the old graving dock and Capitol Park, a private housing development. It is regeneration on a mass scale, with most of the south-side phases of construction now nearing completion. Reading between the lines of the Clyde Waterfront website, I feel Pacific Quay bears little connection to the 25,500 inhabitants of Govan. 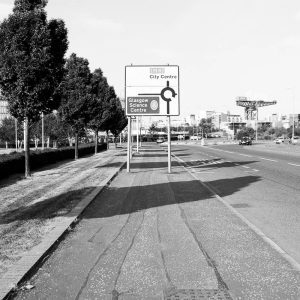 As I walk along Govan Road carrying tripod and camera, two things strike me immediately – the number of vehicles parked on the main thoroughfare and the almost total absence of pedestrians. As I turn into the road leading to the BBC Scotland HQ, a line of cars waits to enter into an already overflowing car park. At the gate, a black parking attendant in a green fluorescent jacket patiently explains the obvious to the irate queue. Meanwhile, a few yards away, the Glasgow Science Centre car park lies three-quarters empty, the two-pound charge clearly a disincentive. 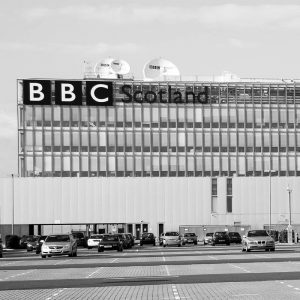 How long before a parking space in Pacific Quay can earn more than a human attendant? Venturing closer to the river, I take my first close look at the new BBC HQ, a 34,000 square metre triple-glazed construction by architect David Chipperfield and Keppie Design, built at a reported cost of £129.25 million. Presumably this sum doesn’t include the broadcasting technology, ‘delivered’ by Siemens Business Services and bypassing the BBC’s in-house engineers. Studying the building, I note the curious way the workers stand, hands pressed to the glass while clutching phones to their ears. Meanwhile outside, people arrive and depart through sliding automatic doors. A man exits, disorientated, while a small knot of staff huddle at the rear, smoking. 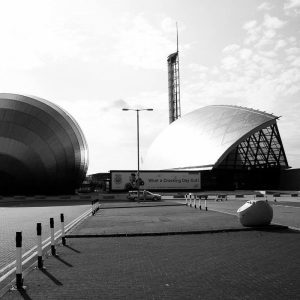 Directly opposite is the Glasgow Science Centre, designed by bdp architects and built at a cost of £75 million through a partnership involving the Millennium Commission, ERDF, Scottish Enterprise Glasgow, Glasgow City Council and The Wellcome Trust. Operating as a registered charity, the centre describes itself as ‘a treasure trove of scientific education and entertainment’. At a current admission fee of £7.95 for adults (£5.95 for children and concessions) the attractions include the ScottishPower Plantarium, a ‘science mall’ comprising three floors of interactive exhibits and Scotland’s only IMAX cinema. The centre is also listed as a five-star attraction by VisitScotland and offers corporate hospitality packages. For an extra two-pound admission charge, visitors can experience the Glasgow or ‘Millenium’ Tower, the second tallest structure in Scotland and the only tower in the world to rotate 360° from the ground up. Since its construction in 2001, at a cost of £10 million, the tower has experienced frequent safety and engineering problems. In January 2005, ten people trapped in a lift waited five hours to be rescued. The tower was closed between February 2002 and August 2004. After further closures, it was finally reopened in December 2006 with weather restrictions. Today there are few visitors at Pacific Quay. Outside on this chill November afternoon, fluorescent-jacketed attendants pace the vast concourse, smoking and talking on their mobiles. A solitary van parked close to the tower is marked ‘Lift Engineers’. 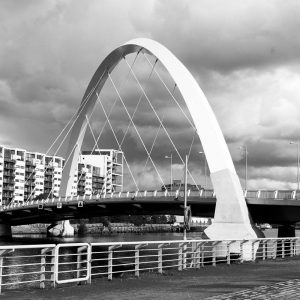 The only pedestrians I see are two young neds crossing the Quay’s pontoon bridge, one of several new bridges spanning the river, the most prominent of which is the Clyde Arc or Squinty bridge built at a cost of £20.3 million by a team led by Edmund Nuttall Ltd. It is the first new surface level road bridge to cross the River Clyde since 1969. The light is fading now. Packing up to leave, I’m both awestruck and perplexed in equal measure, trying to comprehend this place. No-one challenges my presence, yet I still feel like a trespasser. To my mind, these are not public spaces – they don’t feel like public spaces. Unlike any of the great sites of New York, Paris or Rome, the anonymity of Pacific Quay’s architecture – a type seen any major city now – boast no grand entrances, invite no cold callers. Entry must either be granted or paid for. Those without permission and those who cannot pay are obliged to pass through without loitering. As one might experience on any typical city thoroughfare, there’s no opportunity here for chance or impulse. 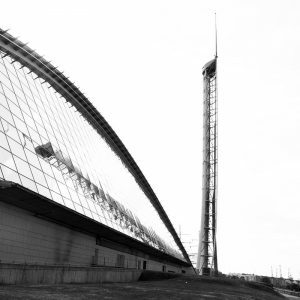 Pacific Quay embodies the elimination of risk, a showpiece in a grand scheme for a Glasgow less concerned with creating welcoming environments than top-down social engineering predicated on car ownership and commerce. Try getting a bus here, or walking from Kinning Park or Cessnock underground stations. It may give the appearance of a public space, it’s highly photogenic but ultimately it’s an alienating place to be. What would Harry Bell make of this, I wonder? In looking for Glasgow’s ancient tracks, he identified sites of prehistoric significance. What I’m finding is that while the city is creating new sites in abundance, the tracks are becoming ever more invisible. My grandmother, Emily Sheridon, lived in the ‘Castle’ at 138 Kintra Street until 1963 just before it was demolished. She lived on the ground floor on the Broomloan Road side. As a youngster I spent my school Easter and Summer holidays with her. On the other ground floor flat lived an elderly couple called McLaughlin. About 2012 I handed in a photograph of the castle to the Mitchell Library for their archives. I don’t remember the Castle myself – my grandmother moved to Brighton St in the late 60s so it would, as you say, have been demolished by then. It was good of you to give the Mitchell a photograph. I wish I could find photographs of my old street in Kinning Park – Sleads St. If anyone has a photo I’d love to see it! Maggie Craig, our neighbour, top landing 112 Neptune Street I believe was a relation of Emily Sheridan. I remember Maagie talking about Emily. I moved from Neptunre Street 1956. The McKeefrey’s lived in the castle. My dad was born at the top of Kintra Street. My Aunt Sarah lived in Neptune Street before emigrating to the US in the 1960s. I’m sure she would have known but sadly she passed away a good few years ago. I hope you got my email about the old Kintra Street Castle. 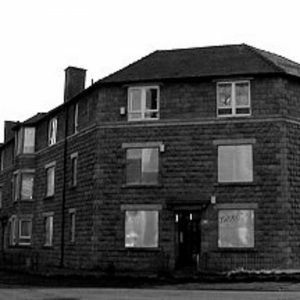 I was born at 19 Lettoch St Govan (Wine Alley) In 1940 moved to hinshellwood drive in Ibrox in the late 40’s early 50’s. The things that I hear about the wine alley are unbelievable, sure the Alley had some problems, but in my day there was a oneness about the people in the alley. they helped one and another through the war years and just beyond, the bad stuff must have happened when the drug culture took over the alley. In no way am I doing down Govan. Quite the reverse. If the Council had invested properly in housing and amenities for the local people it would have been better than to allow the area to get run down to the point where demolition was the only answer. If only a fraction of the money spent on Pacific Quay had been spent on Govan, it would have been so much better for the people who live there. I know the area really well. My grandmother and uncle (and two other aunties) lived there. Another uncle worked at the Govan Press for years. My first boyfriend lived in Iona Court, so I have plenty of experience of the place. I’m glad to hear you enjoyed living there. 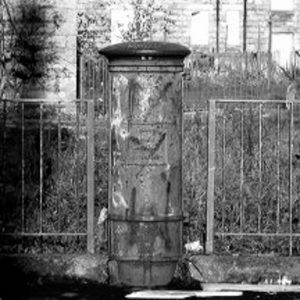 I grew up in Kinning Park and Pollok, places with bad reputations. I know what it’s like to have your area criticised. There’s good and bad everywhere. One of the short films on my website will show Brighton Street, shot over two years. The changes are incredible. Watch out for it at the end of the month.